The Celestron FirstScope is a Space.com top pick for Best Telescopes for Kids. 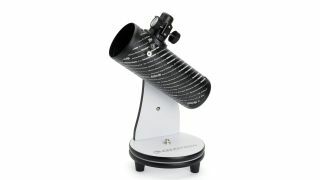 This holiday season, get great deals on skywatching gear for the little space fans in your life. From telescopes to astronomy books, the price is right for these kid-friendly stargazing supplies. And if you need even more gifts for the little space fans in your life, don't forget to check out our main holiday deals page, as well as our Lego deals page and our "Star Wars" deals page. Our year-round telescope pages can help you find the perfect scope for any skywatcher. Check out our main telescope guide, or these guides for beginners, hobbyists, kids, skywatchers on the move and anyone on a budget. For more ideas on gifts for the space fan in your life, check out our space gift guide and our space gift guide for kids. Celestron 21024 FirstScope Telescope: This is an ideal entry-level telescope for kids (or grown-up) beginners. The FirstScope's tabletop spin-and-tilt design makes the device easy for kids to use. The optical tube is decorated with the names of noteworthy astronomers throughout history. Get it on sale today for $41, compared to the usual price of $50. Celestron 21024-ACC FirstScope Accessory Kit: The FirstScope Accessory Kit expands the capabilities of the Celestron FirstScope telescope to give it new features, make it easier to use, enhance your views of the night sky, and make it safer to transport wherever you go. The set includes a 12.5-mm eyepiece, a moon filter, a finder scope and a carrying bag. Get it on sale for $19, down from the usual price of $23. Child's Introduction to the Night Sky: The Story of the Stars, Planets, and Constellations--and How You Can Find Them in the Sky: The title just about says it all! Get the hardcover edition of this book on sale for $10.49, down from the usual price of $20. 50 Things To See With A Telescope: This colorful kids' edition of the best-selling book "50 Things to See with a Small Telescope" explores the constellations with young stargazers, guiding them to dozens of galaxies, nebulae, and star clusters. The paperback version is on sale for $14 (down from $16), and the Kindle edition is available for $10 — or free with Kindle Unlimited.